I used to hire Charm for all of my kids events when they were younger and now find myself seeing her again as the next generation has celebrations. I must say even after years of seeing her in action it was as much of a pleasure as the first show I saw nearly 20 years ago. At any age the children absolutely love her! Her face painting and balloon art is amazing! You wont believe what she can create in just a moment or two unless you see it. I was impressed by everything I saw but mostly by the fact that every child, not just the one at the center of the event, received these elaborate designs and no one walked away wishing they had received more. Charm's heart is in this business 100% and it shows from the moment she walks in to the time she leaves. I wouldn't recommend anyone else. Thank you Charm! for several Grand Openings and Holidays events. make each event operate smoothly. Her attention to detail and follow up are admirable. as CharmandHappy, especiall since she is nationwide. We didn't have to worry about location, contact or payment. Charm and Happy have been a great agency to work for. Very professional and always a pleasure to talk to. They have hired me to work in Arlington Texas at a place called Hart Strings. I am a repeat client and she only uses the best. She will not tolerate being late or any other behavior that is not professional. CharmandHappy is class all the way, completely pro! Carmen (aka Charm the Clown) is a real artiste, her balloon designs and face painting never fail to astound, in my experience. The kids love her too! She's a true American success story, founding and running a thriving small business even in this economy. C&H offers all kinds of things, from bouncy houses to petting zoos! Forget the rest and visit http://CharmandHappy.comtoday. I was hired by Charm and Happy for two face painting events at Hartstrings in Woodstock, GA. The employees at Hartstrings made me feel at home the minute I walked into the door of their beautiful store. Camen is a professional artist who knows how to treat her employees, thanks for allowing me to have this fantastic experience. Working with Charm and Happy is a delight and a privilege. They are consistently informative, dependable and courteous. I have been able to book several work dates through them at Heartstrings Outlet in Myrtle Beach. Charm and Happy pre-arranges all the details, letting me know what to expect and how to be prepared. They send a deposit before the event and are prompt in sending the balance when the job is complete. Heartstrings was very happy to rebook several dates, and I was happy to come back. I highly recommend working with Charm and Happy to any qualified professional. 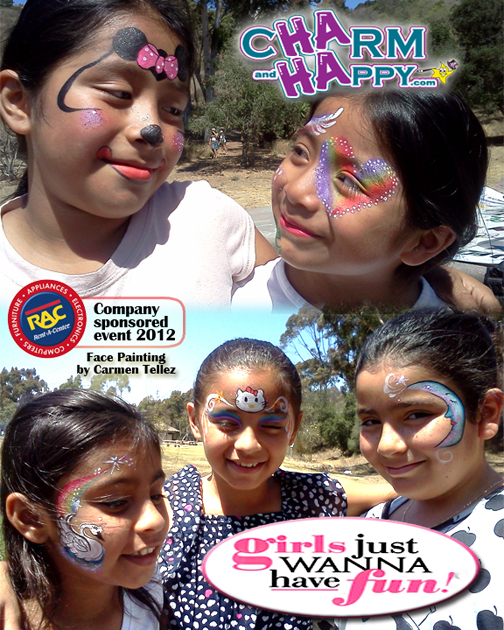 It is a great honor to represent as a Face Painting Artist by Charm & Happy. As a professional face painter represented by Charmed and Happy for Hartstrings Corporation, I am very pleased with their professionalism and clear direction as to what the customer is looking for in specific entertainment. They certainly are a fun and very professional company! I am represented as a Face Painter by Charm & Happy. I must say that Carmen is a delight to work with, and always tries to ensure the clients are happy. Charm and Happy hired me as a repeat face painter for Hartstrings children's clothing store in Destiny USA, Syracuse, New York for several different occasions this past Spring and Summer. From the scheduling, to the guidelines, the correspondence right down to the compensation, everything went smoothly! No hitches or glitches. Extremely pleasant interactions and I am thankful for the work opportunity. As an artist represented by Charm and Happy, I appreciate her professionalism and attention to details. It is very refreshing to work with a company that feels customer service is priority. Charm has been a part of my families party's for years! My son's 15th birthday was in May and he said the worst part about growing up was that he missed Charms shows! Other teenagers that came to his party were even talking about past parties with Charm. Many families that I know have hired her over the years and we have all become return customers. Shes great with the kids and adults offering a fun family oriented event that I have never heard a complaint about. Hopefully she's still around in about 10 years so I can introduce her my my grandkids! Well... these people are awesome!!! just had a party last weekend and it was absolutely amazing!!!! THey are also suuuupppeeerrr legit and professional!! They require a deposit and send a confirmation notice thing and all!! my kids are super picky and the stuff they got done kept them happy forever!! they like these guys more then chuck e cheese and disneyland!! They were ON TIME!!! and... AND... worked the whole time!!!! I love these guys and I'll definitely hire them again! Nick Shepard at Splash Summer Day Camp placed a reservation for a magician for June 25, 2012. I sent him a confirmation and he Confirmed. 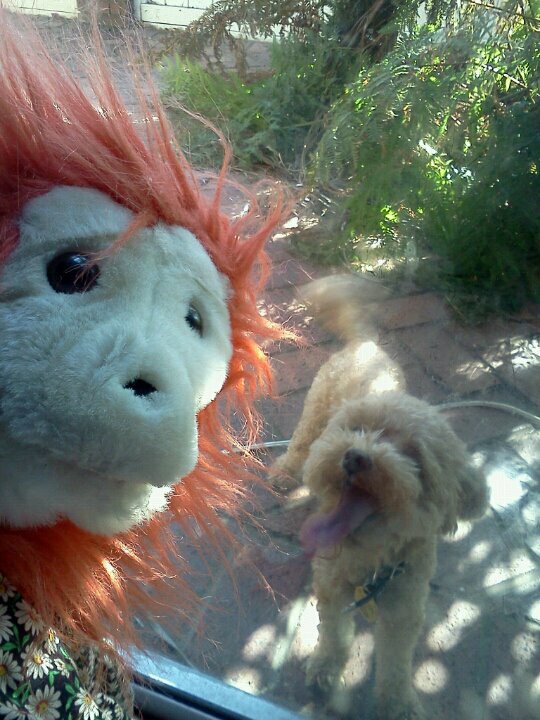 Everything went sooooo well that he called to place an order for a puppet show. Only, this time, he did NOT confirm. He called upset on July 2nd when the puppet show did not arrive. I tried to offer him a replacement since he did NOT confirm via email as was required. He refused the offer. Instead he chose to allow 65 to sit disappointed due to his own rushed mistake. Instead he chose to post a nasty remark on the CharmandHappy com Yelp reviews page. If you need entertainment for your party you can count on Charm and Happy, Carmen is great with kids and adults, and her balloon art and face painting is out of this world..... She has hosted our 3 kids Birthday party's at different ages and she is all ways a hit with our guest, she is a must have at your next party!!! We LOVE Charm and Happy, Carmen is great with kids and all our guest liked her jokes, she keeps the party going, the kids love her balloon art is amazing and face painting is outstanding, and I'm NOT talking about a heart or happy face, I'm talking about works of art on the kids face! the kind you never want to was off. We have had her at all 3 of our kids party's, and we look forward to the next year to see her again. December 26, 2012 Thank you. The face painting was a big hit! we were all pleased with Johnny the face painter. Thanks for coming. The kids had so much fun and my daughter Loved you. Once I get some pictures from my cousin I will send some over to you. Take care and keep our kids smiling! Priscilla. Thank you so much Carmen! We all had a great time at our party because of you and it was unforgettable! THANK YOU FOR DOING MY EVENT THIS PAST SATURDAY FOR MY NEPHEW JONATHAN. KIDS HAD A BLAST AND I LOVED WHAT YOU DID. Carmen, thank you SO much for all the work you did. You did an awesome job entertaining my little guests and I am so happy I found you! I will keep your contact for future reference and I wish you the best. Take care. celebrating 100 years of public service. with the children. Thanks again for saving the day for me. 100 years of public service..
Carmen - I was just about to send you an email with a glowing thank you! We LOVE CharmandHappy.com. Carmen was extremely professional, flexible and most importantly was fantastic with our little kids and BIG kids (aka adults). We only witnessed her amazing artistic face painting and balloon animals, but I know those are just two of the hundreds of great talents she has. This is the second year we?ve hired CharmandHappy.com for our event and we look forward to having her at our event again next year. Michael Sullivan & Associates, P.C. Thanks for everything Carmen!!! Its done- woo hoo!!!!!!!!!!!!! Thanks again a MILLION!!!! The gals were wonderful and very much enjoyed by all! I look forward to working with your crew again very soon! The buttons were great...thank you! I will keep you in mind for future events. I contacted Carmen to book an event for work. This event was a huge success and drew about 400 people at the very least. The kids were happy with their facepaiting and balloons, and the parents were happy with the kids being entertained by Carmne. I wanted to keep booking her for the preceeding events, however, our office budget wouldn't allow it. I do however, recommend Carmen, she is patient with booking and seeing what our budget options are. wow! I had Charm and Happy out for my child's party and Carmen was amazing! I have had other companies, but none have compared to her. We paid a little extra for the full face painting, and the kids had a blast pretending to be leopard's, lions, etc! Carmen is very funny, and she also makes it fun for the adults. I will be having her out again next year. Thank you Carmen! Charm and happy is the greatest! I've seen them for many years at several events and it has always been a great success! They're always very fun and entertaining. Charm is definitely the greatest clown I've ever seen. She is always so sweet and fun to the children. Her balloon animals are complete amazing and adorable! I've also seen her face painting. It was spectacular to say the least. Charm and Happy was hired to face paint and make balloons at my Chevron extra mile Grand opening and OMG the artist was wonderful and talented, was fun to watch and everyone enjoyed and would request them again. Always incredible! The children were delighted and the parents were just as entertained. I am an event planner and have the opportunity to hire children's entertainment several times a year, I always hire http://CharmandHappy.com, they are always one time and do an outstanding job. This time I especially loved the big eyed worm balloons and the alien backpacks, they were fun and unique, not your ordinary twisted dog. Charms facepainting is nothing short of amazing. If you need a "profesional clown, balloon artist or facepainter call this company. The Balloon Artist for our event was awesome. The kids loved their creations. She was very punctual. Our event was formal, she was dressed accordingly. I was overall very impressed. Thank you very much. All parents were happy & had good time. We hope to work with you next time. Thanks again! You did a great job. I will send you a check. Thank you so much for the petting zoo and the pony yesterday. We had a lot of fun, even though it was raining. Theywere great. Thank you again and I'll refer you to my friends in the future. I just want to THANK YOU!!!! very much for your services. My little nice and all the people in the party enjoyed the pony and the petting zoo. The girls helping with the animals were really nice and friendly. Excellent service. I will call you again for our next kid?s party. Thank you so much. The kids and our staff loved Charm and Happy once again. photos with you once I receive them. Just wanted to send out an email with a huuuuge thank you to you and your team! You guys were amazing. The kids (and their parents) loved you guys. From the way the magician engaged to the kids, to the amazing balloon animals and your face paint (which got comments from everyone), there was nothing short of perfection. Thank you for making our party such a success. We'll definitely be using you guys in the future! Wow, what a long day!! You are so awesome, and the kids just LOVE you! I will send you some pictures in just a minute? Thank you again for a great day! Thanks so much for your services Carmen! You always do a fantastic job J Those balloons are amazing! I will be more than happy to submit an online review. I did want to mention one thing to you though. The handler was nice and friendly and helpful. One minor suggestion though. When she brought the rabbits out, she advised the children not to drop them or they may die. I beleive that language was a little harsh for the little ones. Perhaps advise them to say, that the rabbits may get hurt? Having my kids advising other children not drop them or they will die is a little harsh. In anycase, thank you for providing the animals. The kids loved them. That would be awesome.....her father and I would love to take her to see some real magic! Michael...the GM....was walking in when we were leaving and Ryan told him you were a must see. I showed him the ballon animals and stuff and he was really impressed. I I definately played it up for you. I think they will use you for sure!!! i will pray for it too because you are amazing....I am going to also send some pics as soon as they come to me...OK! We have 14 years to go....lol I will also referr you to the ladies that have asked about you from the party, so hopefully some good can come from for yesterday for you too....you made it real special!! Thanks for everything, everyone loved you like always. Everyone had a grand time last night - thank you so much for the wonderful element you contributed to the US Bank party! I am not aware of any photos, at least from our team, but I will ask ------- to keep it in mind and see if anyone from -------- might have caught a shot. To be honest, I think they had a photographer present from their company, but the photos have pretty strict rules about what can be distributed when they are in the hands of a corporate private photographer. It's more a privacy issue for their employees than anything else. Regardless, if anything turns up, I will most definitely let you know! Thank you so much for all of your help! The parents and kids loved you! I will send some pics soon! Please give us a call if you have any questions in regards to the summer. forward to using you guys again in the future! Sent from my iPhone - Amita S.
Charm was on t.v with me on 1 v.s 100 with bob saget, very funny, talented, and as her name implies, charming! she can also make like 1,000,000 different balloon figures I was blown away by her talent-and honestly alittle jealous. "Pinky was AWESOME!!!! Thanks a bunch!" "What a great job Tina Did. I hope to do another party with you." "Sure, I'll take a photo with you Charm"
"Your Star the clown was a hit at my husbands birthday party. as one of her magic tricks. Thank you!" service you provided for Anaya's birthday party!!! were FANTASTIC!!!! GREAT!!! GREAT!!! GREAT!!! above as a testimonial, if needed!!! I hope some day to be as good of a business person as you are. Thanks a lot!" "Carmen, Thank you so much for saving the day for my little Lauren's 1st Birthday. I definitely owe you and Rita." "The CharmandHappy performer for my son's birthday party was terrific! She had the kids engaged throughout her whole stay. The kids all had a great time. The face painting was superb!!! I would definitely recommend and hire them again." "Your tattoo artist was top notch friendly, talented & professional. Everyone loved her. The block party was a success in our eyes. I've received your adjusted invoice and mailed a check yesterday afternoon. Thanks again." "Hello Charmin' Carmen, Just wanted to let you know how happy & delighted everyone was with the characters that performed at our family reunion on Saturday. Nancy put on a cute show that both kids & adults got a kick out of. Your sister was exceptionally fun, talented, entertaining, freindly and super cool. Hope to do business with you again in the future. I forgot the name of your sisters clown character. Would you please remind me. Thank you. Sincerely,"
got her face painted like a kitten - great memory! You are awesome! 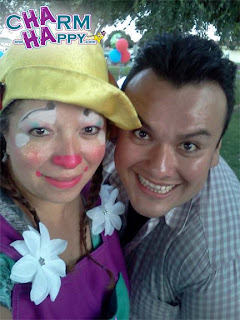 "Dear frieinds, Thank you for sharing your time and talents wth the families of the Loma Linda Ronald McDonald House! We appreciated your compassion and understanding. All our best"
couldn't have asked for a better event. I really enjoyed. "Dear Carmen, Because of your efforts, thousands of residents were able to delight and enjoy The Irvine Global Village Festival. This could not have been so successful without your service. I commend and thank you for your participation." "Just wanted to thank you for another great job at the Marina picnic! The kids had a blast. You do it just like magic! Thank you so much for your help." absolutely use you again. Thanks again! "Carmen, Good morning! Hope you are well today and rested! Thank you so much for all of your work. The kids faces looked great and it was so neat to see their faces all painted around the stadium. We made the playoff's! We would also really like for you to do the hair painting again! Talk to you soon and thank you!"